Blood 'N' Bubble Gossip overheard at the 14th annual Niagara Divers' Association Shipwreck Festival. For the past 14 springs the Niagara Divers' Association (NDA) has held a one-day symposium in a Welland High School, for shipwreck aficionados. The day-long programme is usually heavily skewed to film and slide presentations about the discovery and research of diveable wrecks in the Great Lakes and the St. Lawrence River. Run by NDA volunteers, the event has a very Canadian air to it. Sure there are sometimes glitches in the on-screen presentations (this year the live video feed from the stage had a distinctive green tinge to it), but, everyone is so very friendly and the free lunch they put on is a reminder of the sinful days of my high school before cholesteral and calories was ever talked about (unlimited egg salad sandwiches, roast beef on a bun and Pepsi). The presenters tend to be from the Great Lakes Region - regular people shooting with handheld cameras and self-funding their explorations ... not like the slick circuit talkers who present overly-produced "canned" programmes at the big US dive conventions. The diving audience loved the first-hand account of finding a tug in Lake Michigan, and, looking at pictures of the wreck of St Lawrence paddle wheeler that can be dove right from shore (500 yards from my Dad's home in Prescott). This year, in a abrupt (but very interesting) change the NDA brought in a few speakers who didn't talk about shipwrecks. Dave Mekker, a long-standing member of the NDA dive club gave a 20-minute chalk talk describing how two people died while diving in the Niagara River last year (it appears they inadvertently entered an intake tunnel leading 300 ft down into a hydro generation station). This was the first-time I had covered a conference for Diver Magazine and actually heard people on-stage, talking frankly about the death of recreational divers. It is a brave step forward to talk about something that the industry usually refuses to address in public because it is bad for business. Anyway, back to the business of movies. The other "non-wrecker" at the conference was Jill Heinerth, a Canadian underwater photographer, technical dive instructor and cave explorer. Now living in Florida near Ginnie Springs, she has been involved in a number of notable National Geographic Magazine funded expeditions including a deep Mexican cave trip and the exploration of a huge Antarctic iceberg which included cave diving inside the floating berg. 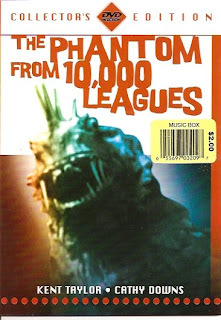 While talking about ther dive pedigree Heinreth mentioned working on the Blood and Bubble Movie favourite "The Cave" (which got my attention).
" I was hired to teach the actors how to dive" she told the audience of 450. "But I was not able to get them up-to-speed in time for them to do their own diving. As a result I became a stunt dive double ... a lot of those shots of men diving inside the cave are actually me! Those Hollywood dive types just did at-the-surface shots for the cameras." Other idle gossip from Heinerth. " I recently welcomed another famous Canadian (Niagara Falls area native) James Cameron to Ginnie Springs. He wanted to look at the caves - he is considering filming a 3-D cave movie." 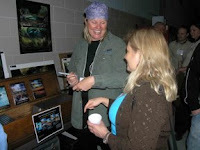 Pictured above is Jill Heinerth (left) talking to Etobicoke Underwater Club executive Marrianne Collins.